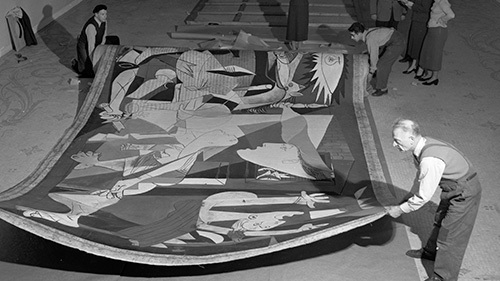 The most recent technical photographic studies of Guernica have enabled the Museo Reina Sofía restoration team to draw certain conclusions for researchers and restorers. Here you’ll find a selection of highlights, abstracts from the complete Restoration study and report. Read the complete Restoration Study. The progress of Picasso’s painting was documented by the photographs Dora Maar took while the artist was working on it. In these series, the composition changes are clearly visible as Picasso worked on different successive stages. These changes can currently be discerned on Guernica through the studies carried out with infrared reflectography, which enables us to look through the successive paint layers. The soldier’s head: This area was heavily worked on. At first the figure was face down, but was later turned by Picasso; this change, however, was not made until well into the composition. A large number of eyes in different forms and positions also appear. The bull’s head: The infrared reflectography analysis reveals eyes in the bull’s head which are concealed by the layer of white paint. The canvas has undergone serious alterations due to multiple tacks pinned in and extracted from the stretcher during its numerous transfers. Moreover, the original stretcher, kept until 1964, lacked wedges and a stretching system, which meant more pressure had to be applied to the canvas using clamps. As a result, the edges were worn, and presented numerous tears, holes and losses of media. The handling and numerous occasions the work was rolled to be transported caused craquelure and a number of fissures and losses of media in the ground and paint layers. In some instances, we can see differences between the craquelure and fissures — although the fissures are larger in number, the craquelure is more serious, longer, and in many cases, affects different layers: the protective layer, paint layer and ground layer. 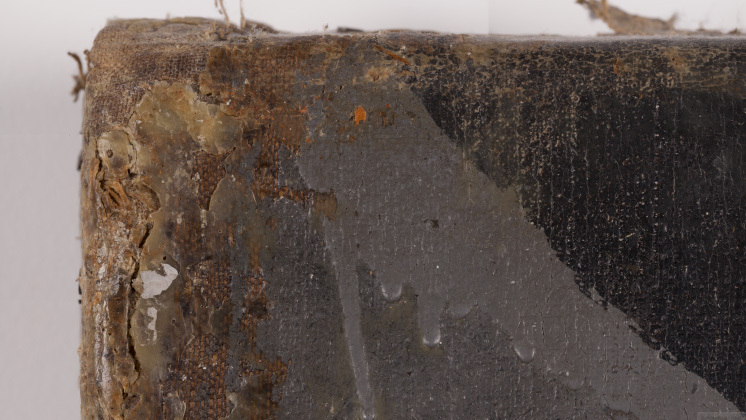 It is worth noting that the presence of craquelure and fissures is directly linked to the thickness of the polychrome — if this is thinner, fissures normally appear, whereas in areas with thick passages of overpaint heavy craquelure is noted. The presence of wax is the result of the restoration treatment performed in 1957 at the Museum of Modern Art (MoMA) in New York. In view of the delicate preservation state of the work at that time — following the movement and transfers it underwent — a decision was made to consolidate the paint later with a mix of melted wax and resin. This treatment involved applying the mix using heat from the back of the canvas to provide consistency in the ground and paint layers. The system, which followed the restoration criteria at the time, had two drawbacks: the treatment was irreversible and the mix seeped through the whole canvas, which is why the work has a large amount of wax spread evenly across the surface, visible to the naked eye on the edges and easily detectable through ultraviolet fluorescence on the rest of the work. Here we can see some of the areas where it is more visible. 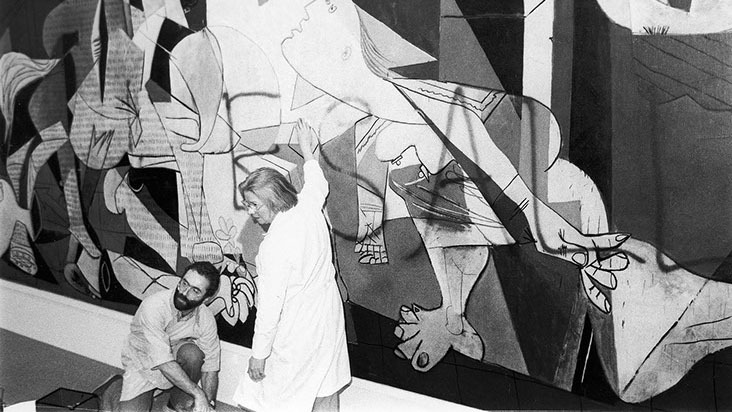 On 28 February 1974, Guernica was attacked with red acrylic spray paint. The attack was perpetrated by a member of the Art Workers’ Coalition group, Tony Shafrazi, who sprayed the words "Kill lies all" on the surface. The varnish applied in 1962 served as a layer to protect the polychrome and the red paint could be removed without damaging the original. At the present time, macrophotographs show reddish micro-residues, almost imperceptible to the naked eye. In some cases, this has entered the fissures. Read the complete Restoration Study. A tool used by specialists to conduct an in-depth study of the work in order to find out its state of preservation. In this mapping system, all alterations are graphically outlined, as are relevant technical issues to study, document and record the work. Under the infrared light they appear traces and rectifications that Picasso was making on the canvas while painting. At the same time, this process was documented by the photographer Dora Maar with images that this map refers to. There are more details of this process in point 4 of the Restoration study that you can read here. Wear caused by a loss of media through rubbing or impact. The crazing of the paint and grounding in different patterns (cobweb, mesh, etc. ), which could cause the denting and flaking of the paint layer. 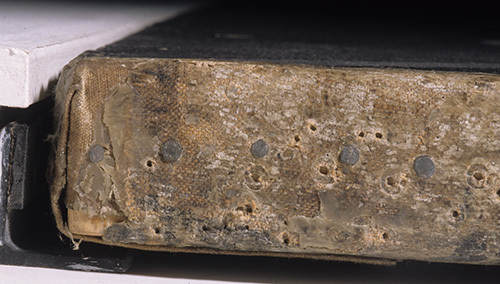 A very thin grey or black layer stuck to the substrata, with an often oily appearance, caused by contaminated environments. 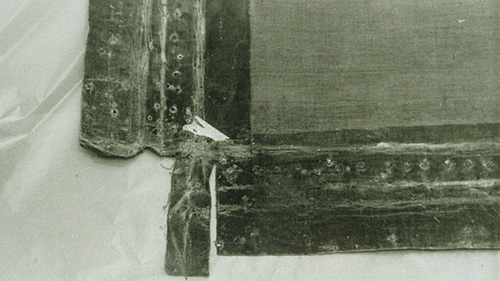 Small fragments of the fabric or warp which have been displaced from the canvas support. Linear cracking produced on the paint layer, grounding or support. A hollow or impact caused by a loss of polychrome, grounding or the support. An area missing from the original artwork. A superficial indentation produced on the paint layer. Paint residues caused by the act of vandalism in 1974. The application of colours to the paint layer to repair or conceal either total or partial damages to the original work, or to alter its appearance. This process is carried out after the work has been finished and normally by a restorer. The chromatic matching of abrasions and losses using reversible materials. Different forms of residue on the paint layer. An adhesive paste obtained by mixing together natural waxes and resins in different proportions. Strokes of paint applied by the artist in successive layers. Lines of the composition under the paint layer. Occasionally, if the top layers are very thin they are discernible in the final work. A set of systems to fasten the work. Remnants of the original polychrome produced by the workmanship of the artist. A superficial indentation made with a sharp instrument. A thick layer of paint, applied with brushstrokes, which appears in relief. The threads that make up the fabric, the support of the artwork. Running paint caused by the artist applying vigorous and fluid brushstrokes. Corrections through the different stages of a work’s artistic creation. The application of paint with the brush. Bristles stuck to the pictorial surface.